Boat Trailer Rollers and Boat Trailer Parts, Trailer Winches, Bunk Trailer to Boat Rollers Conversion Kits, Braked and Unbraked Towing Hitches, Axles, Trailer Suspension, Boat Trailer Wheels,Jockey Wheels. We are also specialists in Jetski Boat Trailer Roller Conversion Kits And Carry A Large Range In Stock. 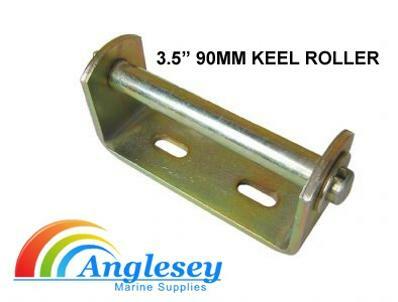 If considering changing your boat trailer bunks or skids to easy to launch rollers then make Anglesey Marine Supplies your first choice. 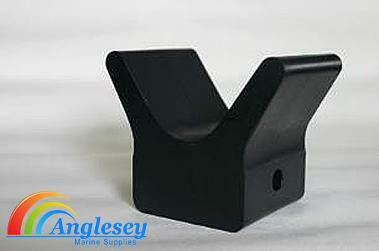 Now Stocking Boat Transom Support Bars And Tie Down Straps. boat trailer parts and boat trailer rollers in stock. 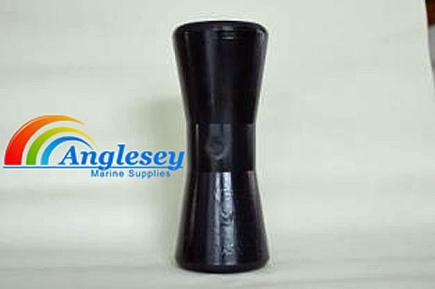 keel roller in a choice of sizes. We manufacture boat trailer conversion kit. 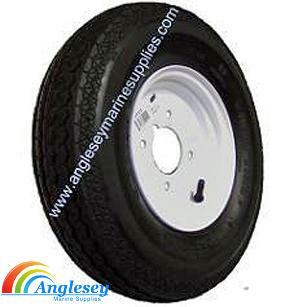 We stock a range of boat trailer jockey wheel for all boat trailers. Boat trailer roller in a choice of colours. 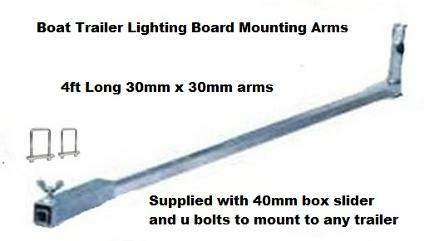 trailer lighting board in a range of sizes. We stock boat trailer suspension units in different sizes. Boat trailer ratchet tie down straps to hold your boat securely. 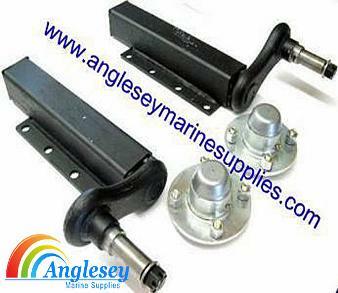 We manufacture a boat trailer rollers conversion kit to change bunk trailer to rollers,Choice of towing hitch for all boat trailers, keel roller bracket, winch post, trailer wheel all in stock. Multi system quality boat trailer rollers double pivoting boat trailer rollers carriages, fitted with non marking polyurethane rollers, fully galvanized, ideal for jetski trailers, bunk to roller conversions or simply adding more rollers to give ease of loading and unloading etc. Our non marking polyurethane tyres on nylon centres are the most durable hard wearing boat trailer roller kit on the marking. Fitted onto fully galvanized roller carriages mounted with a universal bracket that will fit all box section boat trailers. Easy to fit to enable you to convert your bunked boat trailer to rollers easily and effortless. 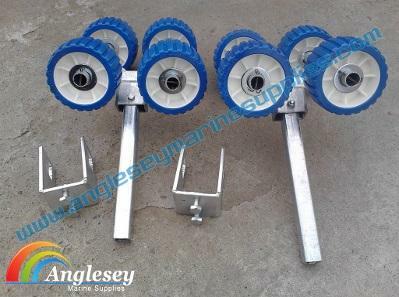 A pair of fully galvanized boat trailer wobble rollers set of four roller carriages assemblies, fitted with four non marking polyurethane tyred boat rollers with nylon centres. Fitted on an heavy duty 34mm outside diameter stem 300mm (12" long). The set of four boat trailer rollers comes with a galvanized clamp that slides over the boat trailers cross members for easy fitting to your boat trailer.Ideal for bunk to roller conversions. Easy to fit clamp on boat trailer rollers. 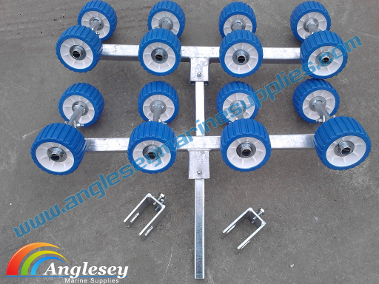 A pair of fully galvanized boat trailer rollers set of six multi roller kit carriage assemblies, fitted with six non marking polyurethane tyred rollers with nylon centres. Fitted on an heavy duty 34mm outside diameter stem 300mm (12" long). Comes with a universal clamp for easy fitting to your trailer. Ideal for bunk to roller conversions. 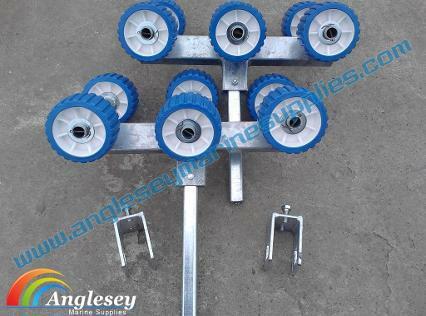 A pair of fully galvanized boat trailer rollers set of eight multi roller carriage kit fitted with eight non marking polyurethane tyred rollers with nylon centres. Fitted on an heavy duty 30mm outside diameter stem 300mm (12" long). 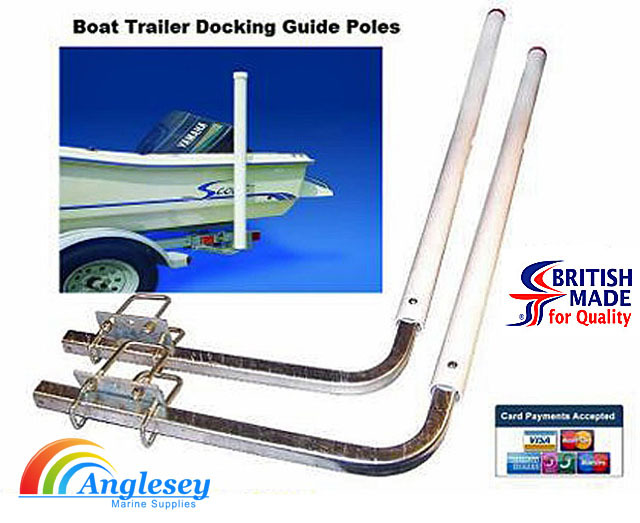 Comes with a galvanized clamp that slides over the boat trailers cross members for easy fitting to your boat trailer. Ideal for bunk to boat trailer roller conversions. Heavy duty boat trailer rollers, a pair of ten boat trailer rollers, set on a heavy duty 80mm x 40mm boat trailer roller carriage. Fully galvanized construction. 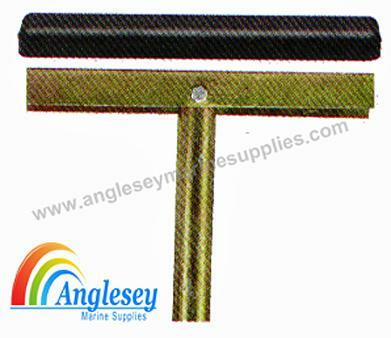 The upright fixing poles for these boat trailer rollers are manufactured from 40mm square box section. The fixing plates are universal and will fit all boat trailers. 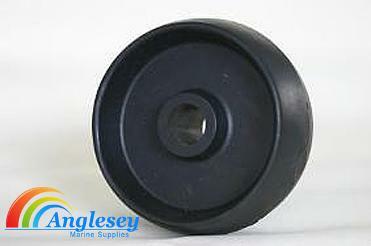 The boat trailer rollers themselves are polyurethane non marking rollers with very hardwearing nylon inserts. A quality set of boat trailer rollers. 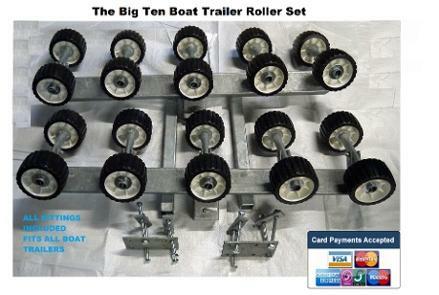 A full complete set up of boat trailer rollers full set bunk conversion kit full set up, enough to transform even the largest boat trailers to rollers. Comprising of a total of 36 nylon wobble rollers with non marking polyurethane tyres for life long use, fitted onto fully galvanized boat trailer rollers spindles and carriages. Now comes with universal brackets and u bolts that will fit all boat trailers. Larger carriages are fitted near to the boat stern and smaller ones near the boats bow. 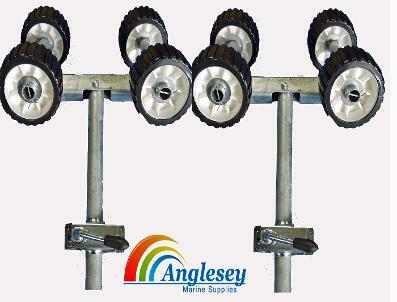 To save work these boat trailer roller carriages can be fitted straight onto the existing stems on your boat trailer. 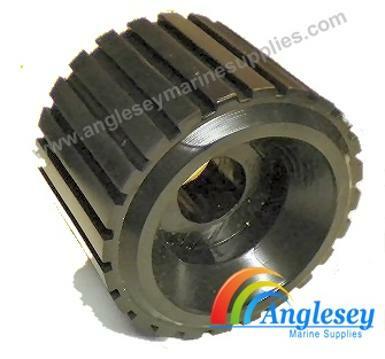 Stems are 30mm x 30mm box section, Boat trailer roller carriages are 40mm x 40mm box section. Boat trailer rollers on plates kit easy to fit, These boat trailer roller carriages are ideal for bunk to roller trailer conversion, adding extra rollers or simply replacing existing worn roller carriages. Can be fixed to swinging arm assemblies. They come fitted with mounting plates and bolts, they will fit on box section up to 100 x 50mm, The carriages are fully galvanised and the wobble rollers are constructed from a non marking polyurethane tyre moulded onto a nylon wheel for durability. 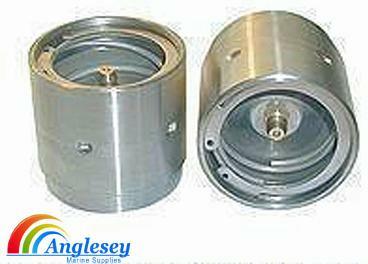 Available in either 4,6 or eight roller assemblies. Prices are per pair. 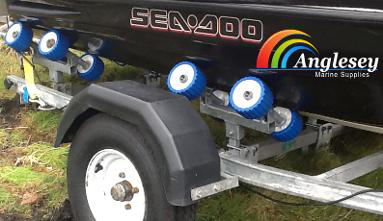 Easily convert your boat trailer to rollers with our full kit of boat trailer rollers on poles with split clamps comes with non marking nylon rollers fitted onto fully galvanized roller carriages. The boat trailer rollers carriages are 300mm long and 40mm x 40mm box section. The roller spindles are 300mm long. The carriages are supported by poles 34mm diameter and 400mm long also fully galvanized. The whole assembly is held by a BZP split clamp which is very easy to adjust in height. 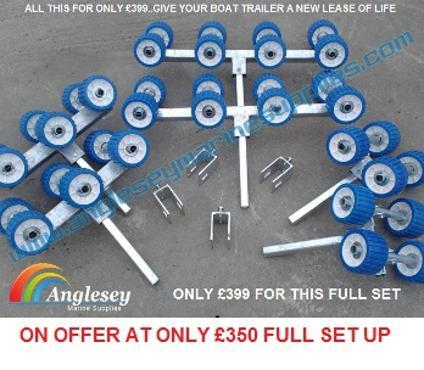 A very cost effective way to convert any small boat trailer, jet ski trailer etc. The roller carriages pivot on the upright poles and also the roller spindles pivot to ensure perfect contact with your boat. You will receive in the kit the following. 16 off non marking nylon centered rollers. 8 off roller spindles. 4 off roller carriages. 4 off 400mm long 34mm diameter poles. 4 off 34mm bzp split clamps. 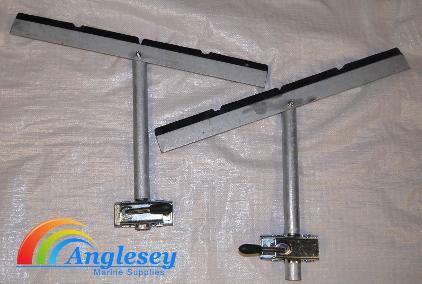 We have for sale a pair of four boat trailer rollers on poles with clamps carriages, rollers, stems and clamps to fit all boat trailers. 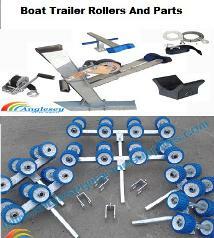 The boat trailer rollers carriages are 300mm long and 40mm x 40mm box section. The roller spindles are 300mm long. The carriages are supported by poles 34mm diameter and 400mm long also fully galvanized. The whole assembly is held by a BZP split clamp which is very easy to adjust in height. Ideal for small boat trailer, jet ski trailers etc. The boat trailer rollers carriages pivot on the upright poles and also the roller spindles pivot to ensure perfect contact with your boat. 8 off non marking nylon centered rollers. 8 off roller spindles. 4 off roller carriages. 2 off 400mm long 34mm diameter poles. 2 off 34mm bzp split clamps. 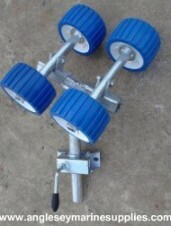 Boat trailer rollers on spindles inc galvanised bar. A tubular steel boat trailer rollers replacement bar fully galvanised (not cheap plating) boat trailer rollers stem 300mm long, 25mm diameter, 20mm thickness centre with a 8mm bolt and nylon locking nut, including two nylon wobble rollers (ideal for ribs, jetskis etc) and washers, split pins etc. 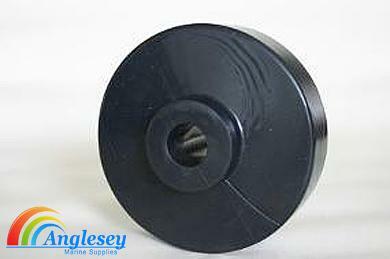 Most rollers are fitted with nylon bushes, this is because the outer material is inferior, well not ours. 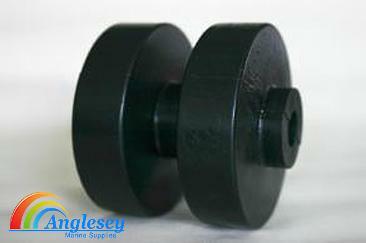 These rollers do not need the nylon bush, because all the centre is nylon!!. And the exterior is manufactured from non-marking / scuffing polypropylene. Boat trailer rollers on short spindles ideal for fitting into boat cathedral ulls, or for delicate boat hulls to ensure less load points. 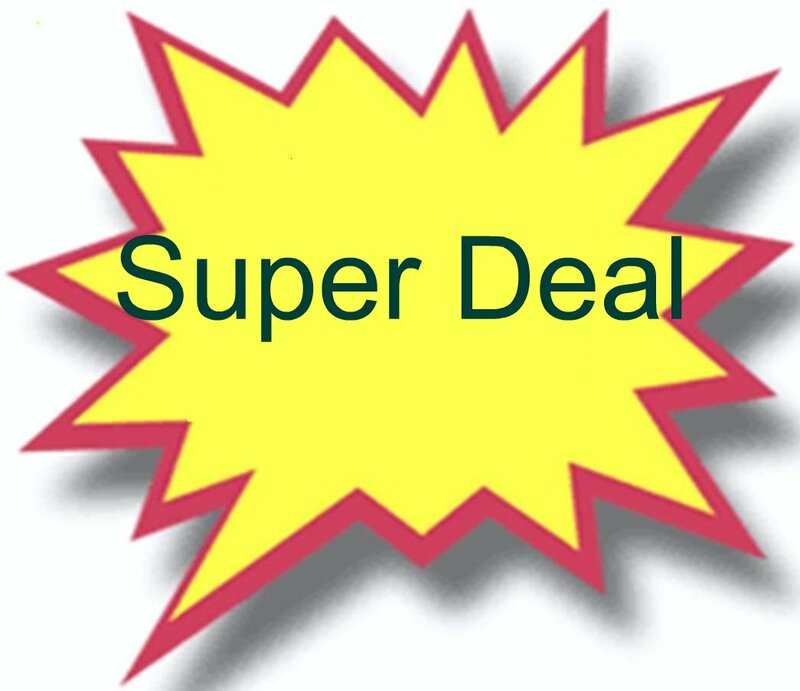 Within the price you receive two boat trailer rollers non marking polyurethane and also a boat trailer roller spindle which is 220mm in length opposed to the normal boat trailer roller spindle which is 300mm. 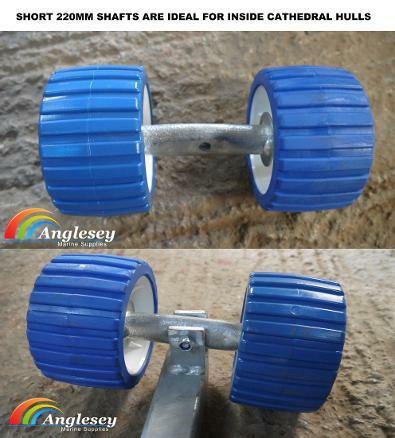 Side mounted boat trailer rollers ribbed with pole and clamp, galvanized finish, comes with two cushioned non marking boat trailer rollers, fitted onto a 300mm long galvanized roller stem. Mounted on a 400mm long 34mm diameter galvanized stem held by a bzp split clamp. 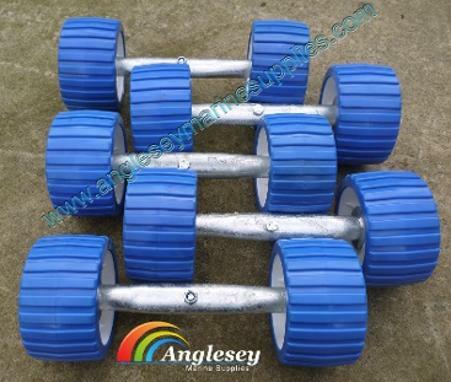 Ribbed boat trailer side rollers with poles and split clamps, galvanized finish, comes with cushioned non marking boat trailer rollers, fitted onto a 300mm long galvanized roller stem. Mounted on a 400mm long 34mm diameter galvanized stem held by a bzp split clamp. You will receive a full set of four comprises of four boat trailer split clamps, 4 upright poles, 4 spindles and eight ribbed rollers. 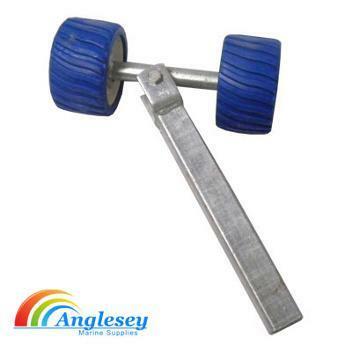 Boat trailer rollers side snubbers with non marking pads, 400mm long pole supports and split clamps. Fitted with non marking pads. Boat trailer side snubbers supports, price is per pair. 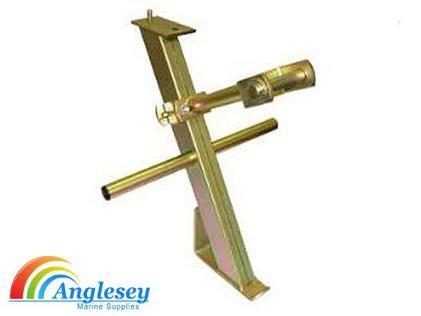 Boat trailer rollers side snubbers supports, ideal for supporting under boats with cathedral hull, Seahog, Cjr, etc. Also ideal for running under tubes on inflatable boats and supporting air decks. Supports are non marking 600mm long. Poles are 400mm long (can be made longer if requested). Comes complete with split clamps. 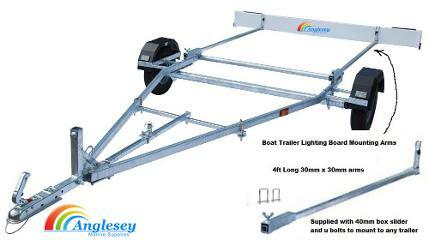 Boat trailer side stands 600mm long fully galvanized supplies also with trailer split clamps. The trailer side stands can be fitted to all trailers to aid stability when loading or unloading etc. 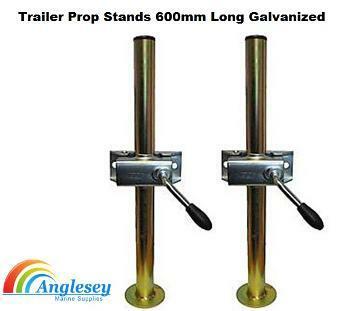 Good quality and good value trailer prop stands at a very good price. Carpeted Boat trailer bunks. The boat trailer bunks are manufactured using 4" x 2" treated timber and carpet covered for protection. Comes with a fitting kit, universal to all boat trailers. 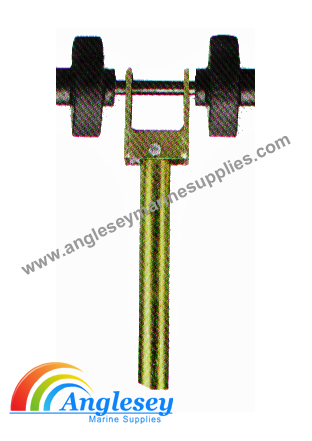 Upright poles are 30mm x 30mm square box section 450mm long. 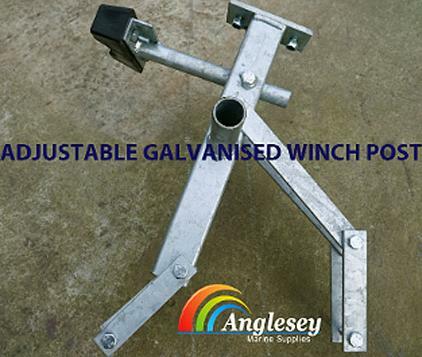 All fittings are fully galvanized and comes supplied with all screws and bolts etc. 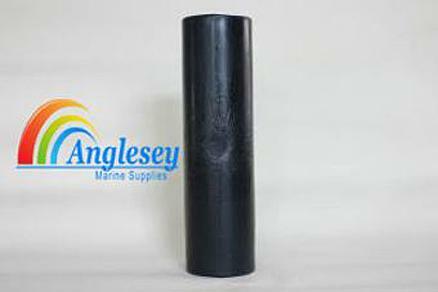 Large boat trailer ribbed rollers 120mm o/d, 32mm bore made from non marking polyurethane. Similiar to ones used on Indespension Trailers. Indespension boat trailer rollers, “Roller coaster”boat trailer rollers & spindle bracket with 2 ribbed boat trailer rollers as used on Indespension boat trailers complete with 2 bushes,washers and split pins. 360mm. long. 8mm. hole. 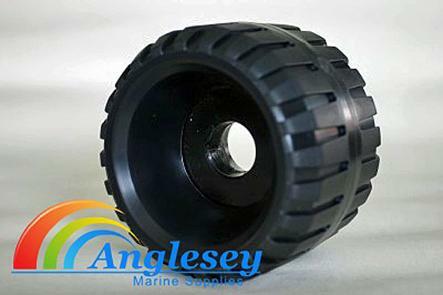 4" Ribbed snipe boat trailer rollers, 21mm bore, manufactured from nylon, lasting and durable, far better than degradeable rubber rollers. 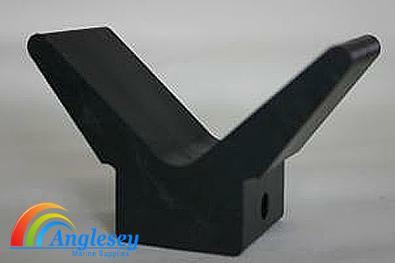 Boat trailer keel roller bracket, 90mm wide with a 10mm spindle, used on small dinghy trailers. 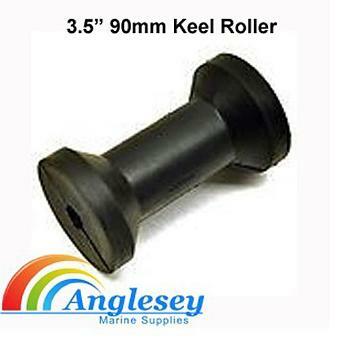 3.5" 90mm boat trailer keel roller manufactured from non marking polyurethane. Accepts a 10mm spindle. 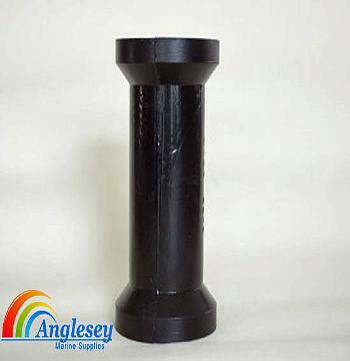 5 Inch Boat Trailer Keel roller, 16mm bore, manufactured from non marking polyurethane material. 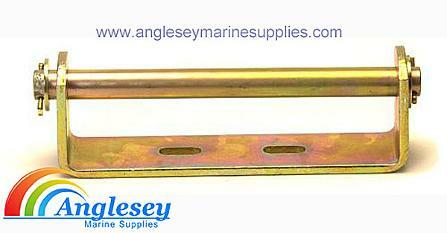 8 inch boat trailer keel roller for boat trailers with a 19mm centre bore, manufactured from non marking polyurethane. 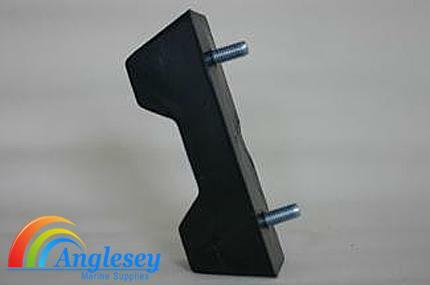 12" Long, 4 hole boat trailer side snubber pad, commonly used on dinghy launching trolleys. Hole sizes to accept 8mm bolts, manufactured from non marking material. 12" Solid pad with moulded in 10mm bolts, bolts 230mm apart, manufactured from non marking polyurethane material, boat trailer side snubber pad. 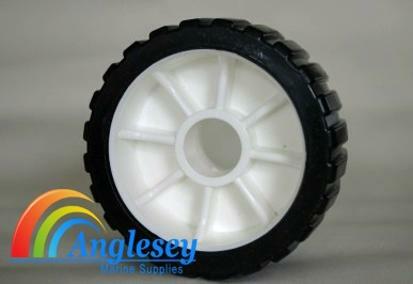 8 inch boat trailer side roller, 58mm outer diameter, 16mm bore, manufactured from anti-marking polyurethane material. 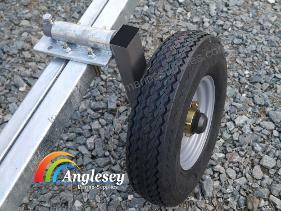 New 200mm boat trailer side roller with bracket and pole assembly for Boat trailers. Bracket is 220mm long 40mm wide with a 16mm spindle. Roller is approx 200mm X 55mm with a 16mm bore. Stems are 440mm long 34mm diameter. Sold singular. Boat trailer double side roller 4" diameter with a 16mm bore, manufactured from non marking material. 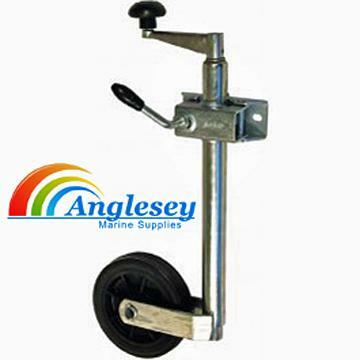 4" Boat Trailer castor roller with 16mm bore, manufactured from anti-scuffing polyurethane material. 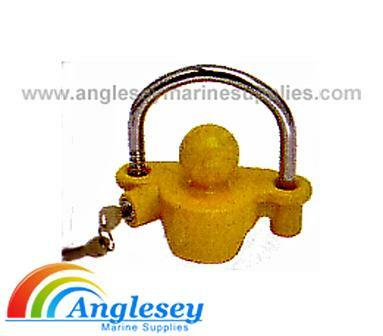 Boat trailer bow snubber small, ideal for small trailers, jetski, dinghy etc. Made from non marking material. 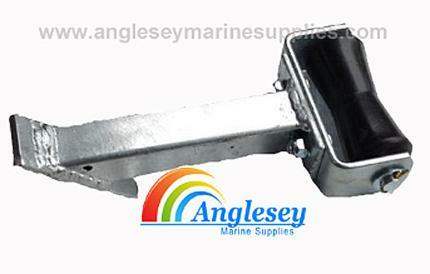 Boat trailer bow snubber medium size without cut out for medium sized trailers, manufactured from non marking material. 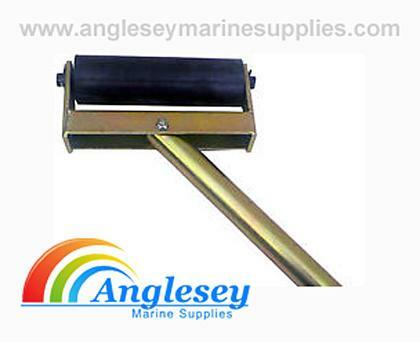 Boat trailer bow snubber large vee boat trailer roller, ideal for larger boat trailers, manufactured from non marking polyurethane. Boat trailer bow roller support bracket, adjusts along boat trailer drawbar to support the boats bow on the trailer, fitted with a 5" keel roller. Please also look at the U bolts at the bottom of the page. 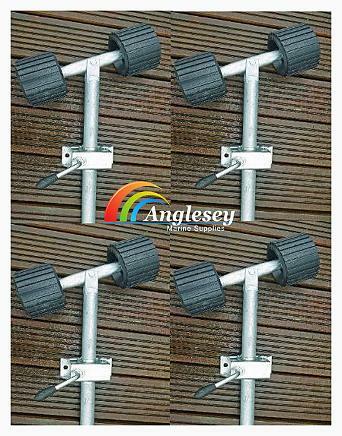 Quality galvanised, (not cheap plated) dumbell double side rollers with pole and clamp on a 16mm solid galvanised shaft and bracket. 34mm heavy duty galvanised stem and a 34mm split clamp. All complete ready to fix onto your boat trailer. 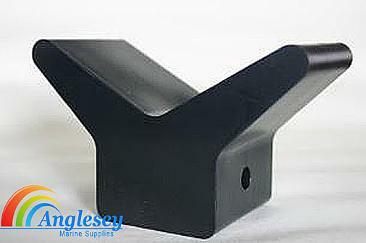 Add extra side rollers to your boat trailer with our new boat trailer side rollers mounting bar. Simply fastens onto your existing drawbar using square u clamps sold on this page at the bottom. Fully galvanized, side rollers and clamps and keel roller all included. Boat trailer docking arms poles. To aid the recovery of the boat and to ensure a perfect line up for the boat on the trailer. Fully galvanized 40mm box section construction. Comes with plastic outer sleeves and brackets to fit all trailers. The boat trailer guide posts are 5ft in height. 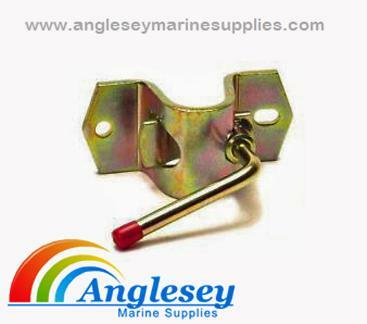 Boat trailer side snubber and bracket zinc plated, c/w nuts and bolts with side rubber and 34mm stem post. Use with our 34mm split clamps (sold on this page). 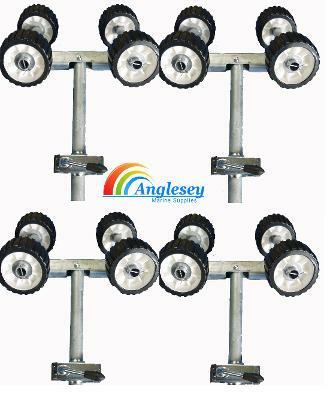 Boat trailer single side roller and bracket, zinc plated, c/w spindle, washers, split pins , nuts and bolts, single rollers, and 34mm stem. 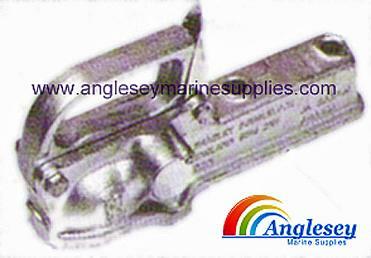 Please use our 34mm split clamps (sold on this page) for fixing to boat trailer. 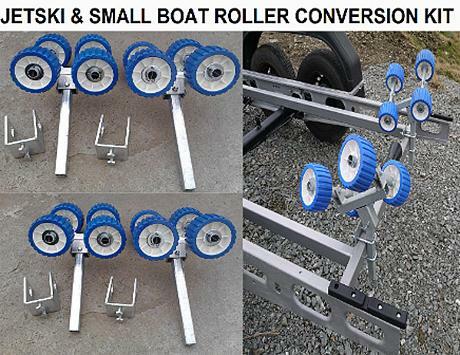 Multi roller jetski conversion kit for conversion of bunked boat trailers to multi rollers. Make launching a lot easier with our ribbed roller conversion kit. Simply replace the existing bunks to the rollers and the jet ski will roll on and off with ease. Fully galvanized construction fitted with anti-marking rubbers. Simple to fit, no drilling involved at a very competitive price. We offer the 4 number four roller carriages which involve removing all your existing bunk trailer fittings and simply replacing with the four roller carriages, next we offer the universal bunk trailer conversion kit which converts your existing bunks to our unique roller bunks and finally we offer our four roller carriages only which simply bolt onto your existing upright supports that are already fitted on your boat trailer. Boat trailer roller conversion kit, simply remove all your boat trailers bunks and brackets and simply replace with our jetski conversion kit, comprises of 16 polyurethane boat trailer wobble rollers, 8 roller spindles, 4 roller carriages, four upright supports and four universal mounting brackets. Galvanised construction. Our new design of boat trailer bunk to roller conversion kit is universal and comes in 3 different sizes.The boat trailer roller bunks are simple to fit and only takes minutes. The boat trailer roller bunks replace the existing skids / bunks using either the boat trailers existing brackets and uprights or using the new ones supplied. 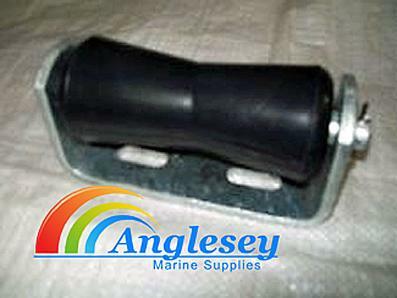 Fully galvanised construction, polypropylene wobble rollers that do not mark the boat. The boat trailer roller bunks are fully adjustable mounting brackets, c/w bolts, split pins all ready to go. 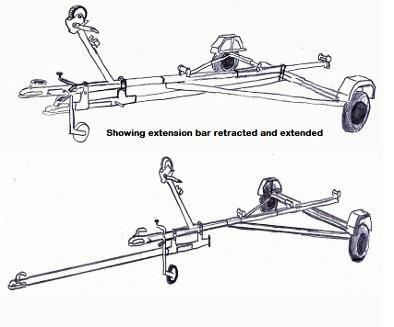 The boat trailer bunk to rollers conversion kit is sold in pairs. This boat trailer bunk to rollers conversion kit is designed to replace those hard to launch skids / bunks to easy to launch and load boat trailer rollers roller bunks. Non marking polyurethane rollers with nylon inserts, galvanized roller carriages and spindles, comes supplied with all fixing bolts. Boat trailer bunks fixing clamp brackets, the bunk uprights simply pass through the square holes and then you tighten the bolts thus trapping the upright tight against the boat trailer cross member. Just choose the size required and number required from the drop down menu. 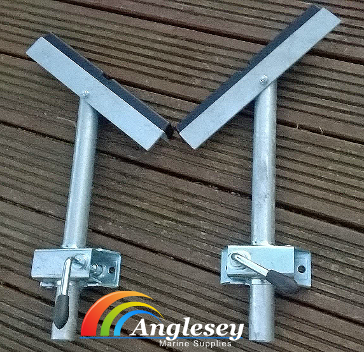 We supply all type to suit either 30mm x 30mm bunk uprights or 40mm x 40mm uprights to clamp to various boat trailer cross member depths and widths between 25mm to 50mm. Boat trailer guide posts Uk. To aid the recovery of the boat and to ensure a perfect line up for the boat on the trailer. 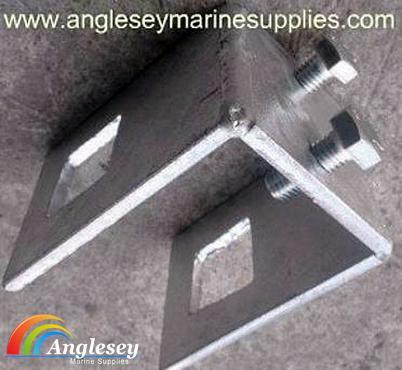 The boat trailer guide posts are fully galvanized 40mm box section construction. Comes with plastic outer sleeves and brackets to fit all boat trailers. The boat trailer guide posts prevent misalignment of your boat on the boat trailer. The guide posts overall height are 5ft in height so suits most boat trailers. Price of the boat trailer guide posts is per pair. A quality pair of boat trailer docking arms. 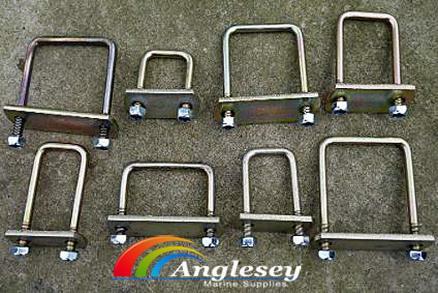 Anglesey Marine Supplies stock a wide range of boat trailer winch post and winches. 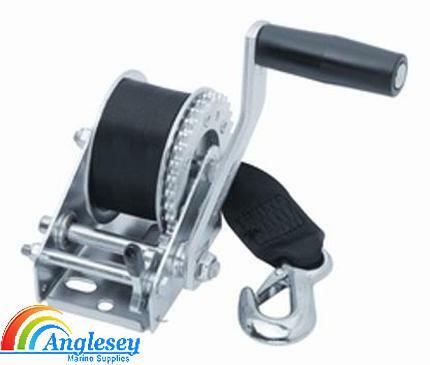 We stock a variety of boat trailer winch posts, including our very popular adjustable boat trailer winch posts. 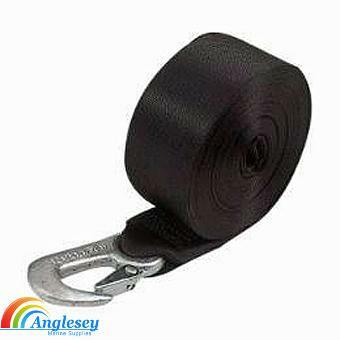 We also stock replacement boat trailer winch straps and also boat trailer rubbers to suit the winch posts. 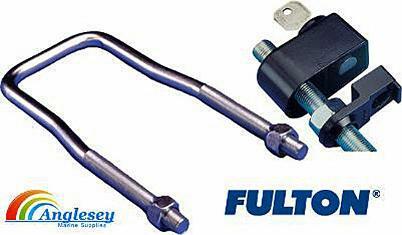 Fulton boat trailer winch quality brand single speed winches designed to meet your toughest pulling demands. Our winches feature efficient gear ratios, full-length drum bearings, oil-impregnnated shaft bushings, and our "Comfort Grip" handle for ease of cranking. All gears are high-carbon steel for superb strength and long-term durability. Stamped carbon steel frames provide rigidity for gear alignment and longer cycle life. Zinc finishes provide excellent corrosion resistance in all environments. Economy zinc passivate finished boat trailer winch with strap and bolt. Please use drop down bar for size choice. 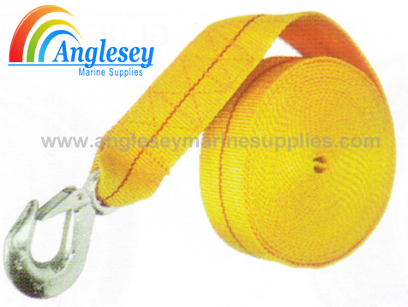 Boat trailer winch strap, Manufactured from polyester with looped end. 50mm wide x 8 metres in length. 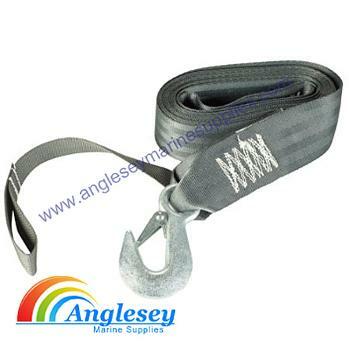 Heavy duty boat trailer winch strap. Winch strap is designed for larger 2000-2500lb. winches. Manufactured from heavy duty webbing. Jet ski winch strap with extra 18” x I’’ loop attached to hook webbing. 4m long. C/w bolt. Fastens onto all our boat trailer winch assemblies. 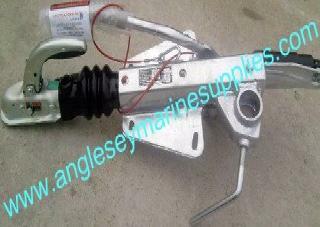 Zinc plated boat trailer winch post suitable for most small boat and jetski trailers. Easy to fit and will accept all small boat trailer winches. Also included is an adjustable bow buffer for boat protection. Buffer pad also included. Adjustable boat trailer winch post galvanized finish. 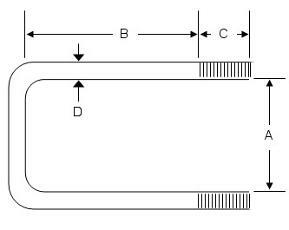 The angle of the post is simply determined by the angle in which it is bolted onto the drawbar. It can be set to suit your needs. 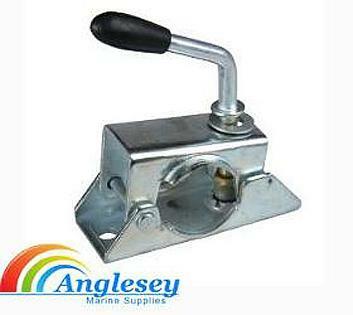 Comes supplied with an humpback snubber block and all bolts including winch fitting bolts. Maximum size drawbar fitted to is 100 x 50mm. 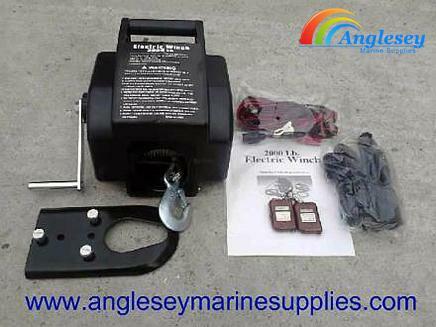 12 volt portable powerful electric boat trailer winch for fitting to vehicles and trailers. Will handle loads up to 2500kg or with a double line loads up to 5000kg. Has a 3 metre cable, fitted also with an emergency crank handle. As a remote control keyfob, a remote umbilical and crocodile clips for easy connection to your boat or leisure battery. 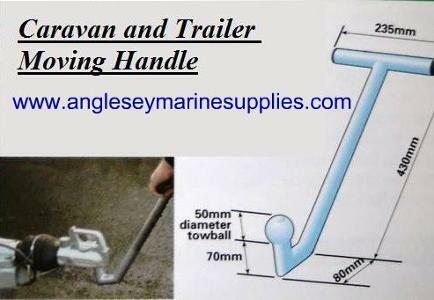 A Bargain Product and one of our best sellers, our simple yet effective caravan or trailer moving handle, makes back breaking work a whole lot easier. Heavy Duty Boat trailer split clamp for jockey wheels and boat rollers upright clamp. Accepts all 34mm tubes. 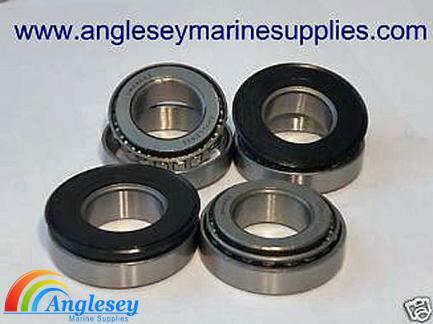 A complete set (for one axle) of 1" (25mm) taper roller boat trailer wheel bearings, these are the most popular sized bearing, used on most small jetski, dinghy trailers etc. Comes complete with rubber protectors and bearing race. Other bearings available on request. 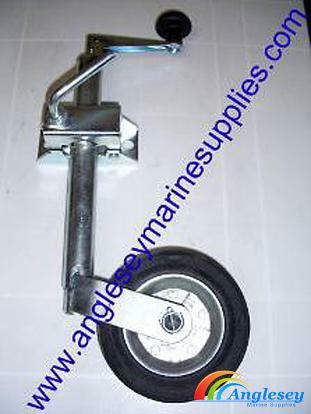 Lightweight boat trailer jockey wheel for lightweight boat trailers and utility trailers. 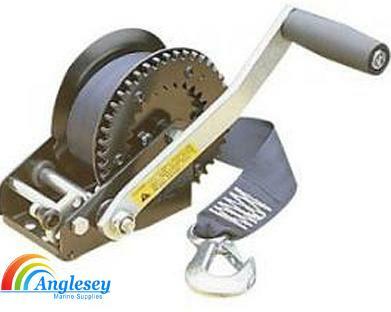 The trailer jockey wheel comes with a 34mm split clamp. Zinc plated finish for corrosion protection. Ideal for smaller unbraked boat, dinghy, jetski trailers. A cost effective priced medium duty boat pneumatic trailer jockey wheel pneumatic wheel making it effective on sand, mud, shale etc. Telescopically adjustable to aid trailer removal from vehicle, comes complete with fixing clamp. 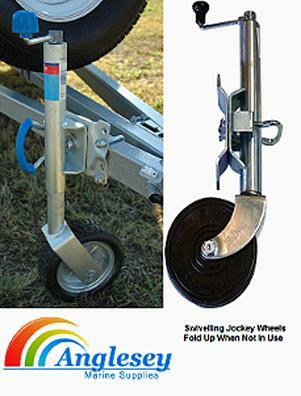 Quality Fulton boat trailer jockey wheel swivelling, also telescopic so acts the same as a normal jockey wheel but swivels out of the way when not in use. Universal fitting allows fitting on trailer drawbars up to 3" x 5" box section, bright zinc plated finish. 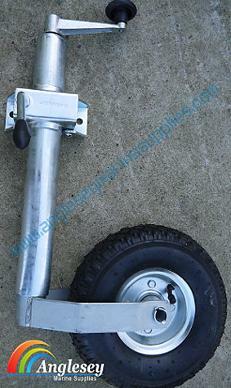 Heavy duty boat trailer jockey wheel, 48mm ribbed construction. 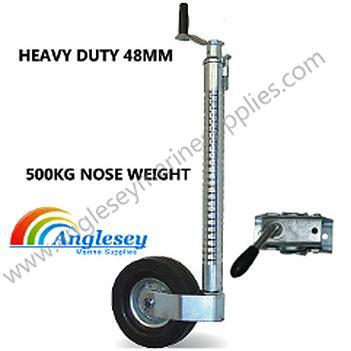 500kg nose weight capacity, used on large boat trailers. Comes complete with clamp. 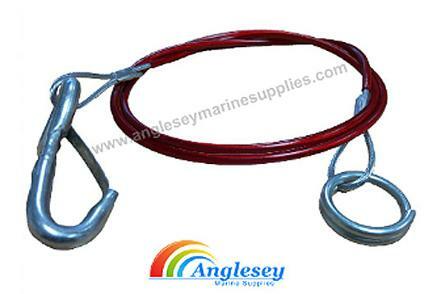 Boat trailer breakaway cable trailer safety lanyard. This maintenance free lanyard is made from plastic coated cable and s/s hooks. Used to connect trailer to vehicle. Applies the trailer brakes if trailer is detached from vehicle. A legal requirements on U.K roads. Quality pressed steel trailer boat trailer towing hitch, ideal for small lightweight boat trailers, bike trailers, utility trailers up to 750kg gross weight. 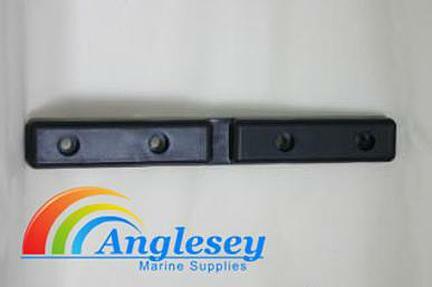 Cast steel 750kg boat trailer towing hitch. suitable for boat trailers, utility trailers, goods trailers etc. 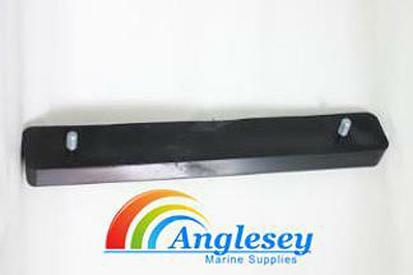 New product this year our boat trailer launching extension bar, enables an extra 6 feet of drawbar to be added to your boat trailer when launching and recovering your boat.The larger box section as predrilled plates and bolts supplied, this bolts to the underneath of your boat trailer. 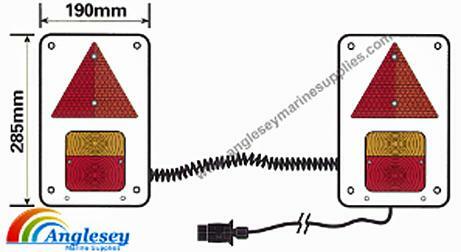 When not needed it simply retracts under the boat trailer out of the way and is held in position.When launching the drawbar is retracted and held in position giving an extra 6 feet of drawbar length keeping your car out of the water.Will clamp onto 50mm x 50mm box section. 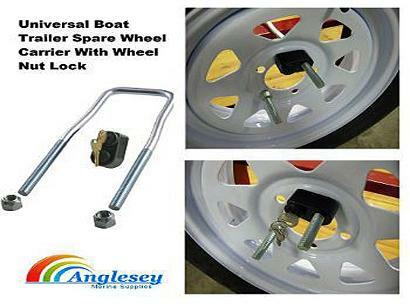 Universal boat trailer hitch lock. Suitable for most cast and pressed steel 50mm couplings. Complete with 2 keys. Boat and caravan trailer security at a cost effective price. Boat trailer suspension units mounting plates, finished in self colour ready for welding onto beam axle. Standard hole sizes to fit all units up to 750kg capacity. Boat trailer axle finished in either weld on primer or fully galvanised finish, available in sizes of 4 ft, 5 ft or 6 foot. 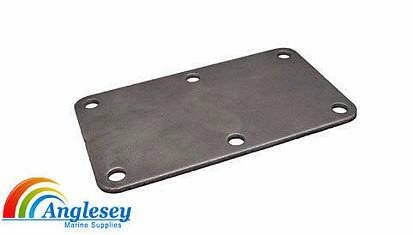 Fitted with standard six hole suspension unit plates, can either be mounted using u bolts sold at the bottom of this page or weld on. 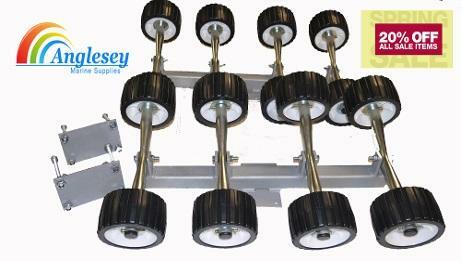 Unbraked boat trailer suspension units, simple bolt-on design, electro-plated protective finish. Available in different sizes please use drop down menu bar for size choice. 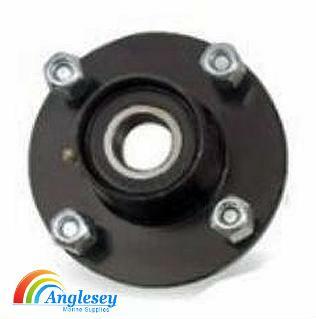 Quality cast unbraked boat trailer hub, 4" PCD four stud, complete with bearings and outer protective dust cap, spare nut and grease. Set of four AL-KO drum 200x51 (drum ID=200mm x shoe width=51mm.) , 4 on 100mm. with sealed bearing. AL-KO part no. 573192. The sealed bearing inside is for the AL-KO 200x51mm. Euro drum. AL-KO part no. 581169 The trailer bearing size is ID=39mm., OD=72mm., H=37mm. Standard Grade non-European bearing. 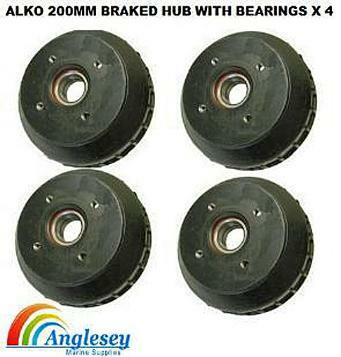 Normal retail on these is £120 each however receive the full set of 4 Alko 200mm braked hub with bearings. Boat trailer bearings savers protectors manufactured from stainless steel. Comes complete with covers to prevent dirt and water intrusion. 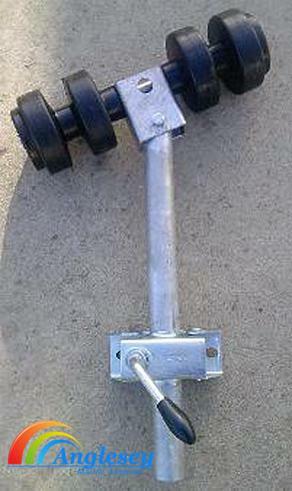 Boat trailer axle made to spec. Custom built to suit your requirements. Fitted with boat trailer suspension units. 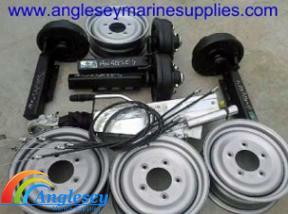 Ranging from lightweight 250kg units to 3600kg boat trailer axle carriages. Boat trailer suspension units unbraked complete with 1" taper roller bearings, hubs with wheel nuts and protective caps. Range of sizes from 200kg to 650kg, Please use menu bar for size choices. 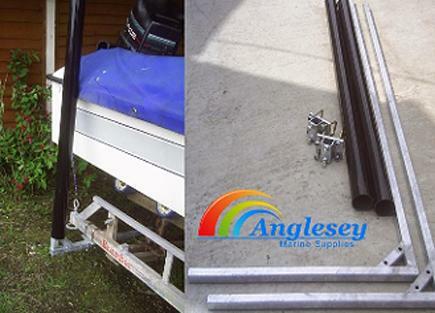 Full diy trailer building kit in a range of weights from 250kg to 350kg. 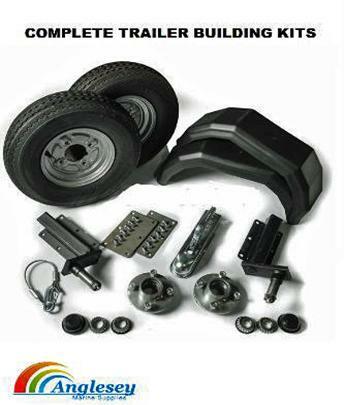 Trailer kit 250kg or 350kg (use menu for choice) with standard stubs and 8" wheels. Kit consists of the following: - safety cable - pressed steel coupling - suspension units 250 kg or 350kg with standard stubs - 1" taper hubs x2 - mounting plates x2 - PVC mudguards x2 - 8" wheel assemblies x2 - mounting bolt x12 - M8 Nylock x12. Quality 400X8 boat trailer wheel and tyre, suitable for small boat trailers and utility trailers. 4 stud 4" pcd wheel centre. Boat trailer wheels and tyre complete. A ten inch steel rim wheel fitted with a 4 ply tyre. A choice of radial or crossply, please use drop bar for choice. 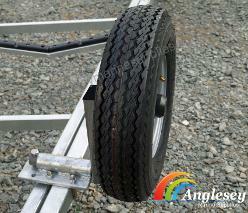 Boat trailer spare wheel carrier, manufactured from durable galvanized steel for maximum protection. Fits all trailer wheels from 8" to 15". Universal boat trailer spare wheel carrier holder. Fits 8", 9", 12", 13", 14" and 15" wheels with 4 or 5 lug rims - Easy to install - Includes lug nuts to secure wheel to frame - Heavy-duty 1/2" diameter construction - Zinc plated to resist corrosion - Theft resistant locking cap - Locking cap provides positive locking feature to prevent lock from turning. Also available without lock, please use menu for choice. 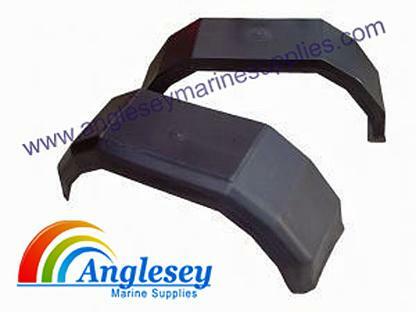 Sturdy plastic injection moulded boat trailer mudguards, sold in pairs. Available for wheel sizes 8", 10" and 13". 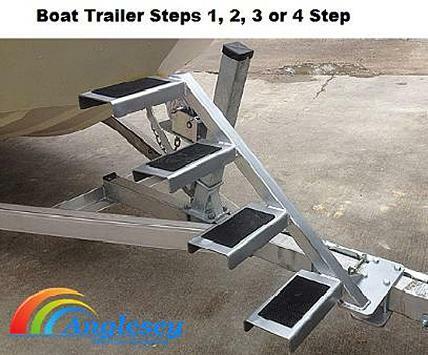 Range of quality boat trailer steps-boat steps coming soon. Fully galvanized construction. Available in either 1, 2, 3 or 4 steps. Simply clamps onto your boat trailer drawbar, no more trying to struggle to get into your boat using unsafe step ladders etc. M10 Metric boat trailer U Bolts, high tensile, zinc and yellow passivate finish. 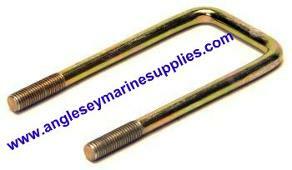 All boat trailer square U bolts have 30mm of thread which is an extra on the sizes stated. loads in stock to fit all Boat Trailers. A=40MM, B=40MM, C=30MM, D=10MM only £2.40 each. A=40MM, B=80MM, C=30MM, D=10MM only £2.80 each. A=50MM, B=50MM, C=30MM, D=10MM only £2.60 each. A=50MM, B=76MM, C=30MM, D=10MM only £2.80 each. A=50MM, B=102MM, C=30MM, D=10MM only £2.99 each. A=40MM, C=60MM, C=30MM, D=10MM only £2.60 each. A=60MM, C=60MM, C=30MM, D=10MM only £3.20 each. A=70MM, C=76MM, C=30MM, D=10MM only £3.40 each. A=80MM, C=46MM, C=30MM, D=10MM only £3.50 each. A=80MM, C=86MM, C=30MM, D=10MM only £3.60 each. 40mm U Bolt Plate. (40mm x 6mm). Zinc and Yellow Passivate Finish only £1.80 each. 50mm U Bolt Plate. (50mm x 6mm). Zinc and Yellow Passivate Finish only £1.99 each. 60mm U Bolt Plate. (60mm x 6mm). Zinc and Yellow Passivate Finish only £2.20 each. 70mm U Bolt Plate. (70mm x 6mm). Zinc and Yellow Passivate Finish only £2.40 each. 80mm U Bolt Plate. (40mm x 6mm). Zinc and Yellow Passivate Finish only £2.60 each. 5Omm width boat trailer ratchet straps tie down straps. To secure boat to trailer. In two halves c/w hook ends. 1000kg breaking strain. Two lengths available, 5.5 metres long and 8 metres long. Use drop bar checkout menu for choice. 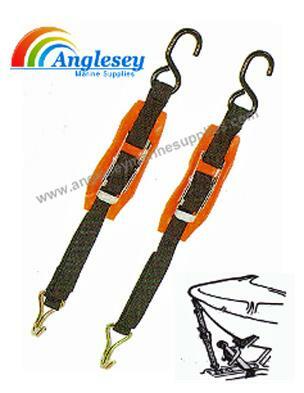 Pair of ratchet stern boat tie-down straps with protective pad to avoid marking transom. Features strong 50mm web strap with coated hooks. Adjusts from 40cm. to 150cm. Especially recommended for larger boats and cruisers. Packed in pairs. Pair of standard duty boat trailer ratchet tie-down straps. 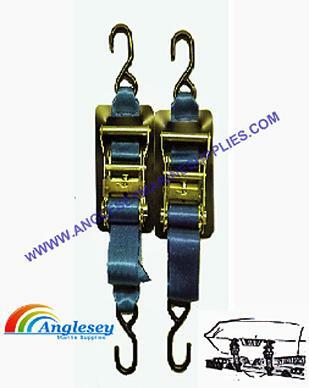 Features 25mm webbing strap with zinc plated locking clamp and coated attaching hooks. Also supplied with protective pad to avoid marking boat. Adjusts 40cm. to 120cm. Packed in pairs. 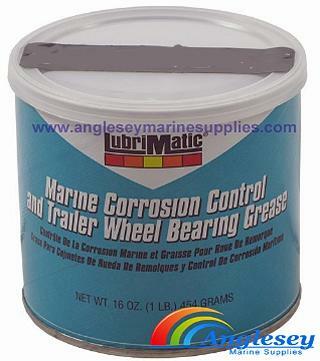 Marine corrosion and boat trailer wheel bearings marine grease l6oz. (U.S.) can. Perfect for winterising and when fitting new wheel bearings. Also for using on and around the boat. Part of the new UK trailer towing law requires the boat trailer lighting board to be fastened to the boat trailer itself and not hanging loosely from the boat. Our boat trailer lighting boat arms are the easy solution to this problem. They are manufactured from 30mm x 30mm box section, fully galvanized. The lighting board simply slots into the u plates welded onto the arms. The lighting board arms are 4ft long and are supplied either with or without a clamp on slider. Some boat trailers have this facility already fitted so our lighting board arms simply fit into the existing slot. If your boat trailer does not have this feature then our sliders are 40mm x 40mm box section on a mounting plates. 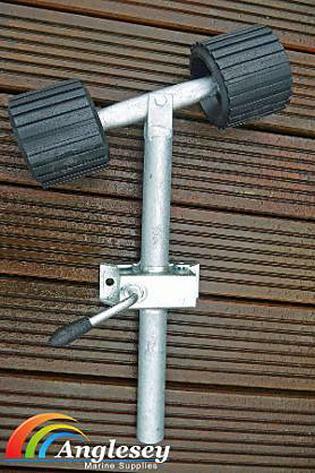 This is then clamped onto your boat trailer with our fixing bracket (supplied in the kit). The arms then slide into the sliders and tighten up in the required position. 6 foot (1 83m.) white boat trailer lighting board 6ft, c/w 8m. of 7 core cable, 7 pin plug and 1 rear fog lamp. Magnetic trailer lighting unit. Consists of 4 function lamps fitted to metal magnetic plates. Wired with extendable connecting cable, for easy attachment. 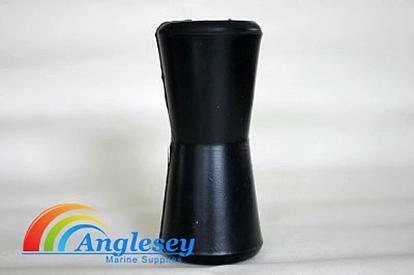 Ideal for easy fixing and removing, also perfect from boat park to launch on short road trips. 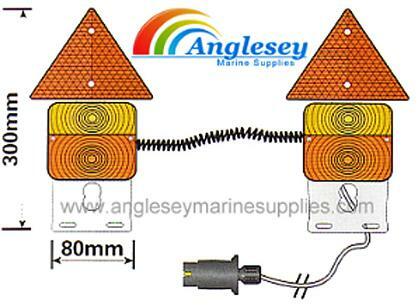 Adjustable boat trailer lighting board, consisting of 2 durable plastic light modules each fitted with lamp and triangle. These are connected by an extendable cable (up to 2m) 7 core cable lead is 6m. Packed in poly carrying bag. 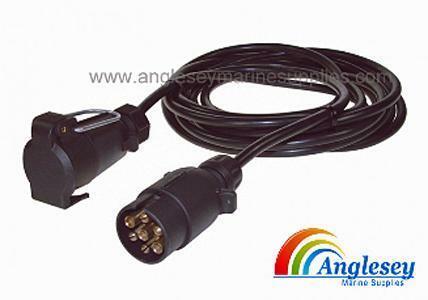 6 meter boat trailer lighting board extension cable for trailer boards. Ideal for fastening on the boat trailer and leaving in situ thus removing only the board when launching. Please keep checking as stock is being added daily and the list is not yet complete, please contact if you require an item that as not been added yet.